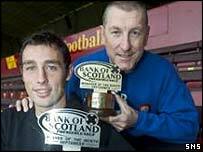 Motherwell's Terry Butcher has been named Bank of Scotland Premierleague Manager of the Month for September. And Fir Park striker Scott McDonald has picked up the player's award after scoring four in three league games. The Australian-born forward has found the net six times this season and there have been calls for the 21-year-old to be called up for Scotland. Butcher, who is entering his 30th month in charge of Motherwell, has lifted his side to third place in the SPL table.